An increase in conversations on diversity indicates that people are starting to come round to the importance of more than a token few woman and people of colour on our stages. White male dominance in theatre is increasingly being called out, with some small and mid-sized venues and companies leading the way on diversifying their work. But physical disability draws less attention in the diversity debate, and learning disability even less so. 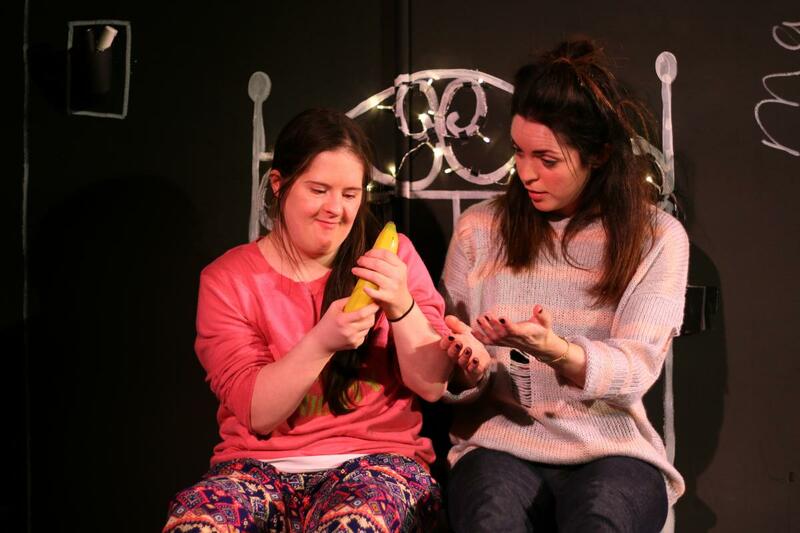 Stephanie Martin’s Joy challenges the later with learning disabled characters played by trained actors with learning disabilities. It’s a play and a directorial choice commendably at the forefront of diversity and accessibility, but like all vanguard work with no previous models to follow, it needs further shaping and development. Martin’s contemporary story of two sisters, Joy and Mary, has a sound dramatic arc that underlines the fact that people with learning disabilities deserve the same rights and support as anyone else, and may want the same things – jobs, relationships, families. Joy, a spirited young woman with Down’s Syndrome, certainly lives up to her name and brings plenty of lightness and laughter to the script. Her non-disabled sister serves as a sidekick, enabler and mother figure, making Mary the most complex and dynamic character. This narrative is paralleled by a pair of Victorian sisters, one of whom also has Down’s Syndrome, who are fighting a vicious battle for survival in a world with no place for those who are poor or differently-abled. This is more of a subplot and whilst there are parallels between the character pairs, it feels underdeveloped and only tenuously linked to Joy’s coming-of-age tale. It’s great to see a genuinely diverse cast working so in tune with each other. The support and camraderie is gleefully tangible in transitions and within the scenes, with time and patience confidently bestowed as needed. The pace wobbles occasionally, but it largely holds steady. Joy is not the most refined of scripts, but it’s a great idea worthy of exploring, and a vital conversation starter. Though a small studio production, I hope it’s impact resonates far beyond. Joy runs through 4 November.